Ford S-Max Performance, Engine, Ride, Handling | What Car? The range kicks off with a 1.5-litre turbocharged petrol, but this engine is difficult to recommend due to its comparatively high CO2 emissions and less-than-impressive real-world fuel economy. 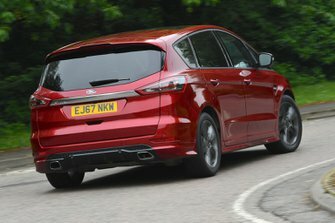 Likewise, although the performance from the 2.0-litre turbo petrol is very impressive for an MPV, this engine will be very expensive to run compared with the diesel alternatives because of its poor fuel economy. We’d avoid the weakest diesel engine, though; the 118bhp 2.0-litre unit needs to be worked hard when the S-Max is loaded up with people and baggage. However, the 148bhp version of the same unit pulls strongly enough across a broad rev range, so can easily cope when the car is heavily loaded. It's the sweet spot in the range and offers the best blend of performance and economy in the line-up. There are also 178bhp and 207bhp versions of the 2.0-litre diesel. The former is worth considering if you want a bit more oomph, but the range-topping version – which is available only with a six-speed automatic gearbox – is difficult to recommend because of its high price. The 148bhp and 178bhp diesel engines are also available with four-wheel drive, making the S-Max a good choice if you live in a part of the country affected by harsh winters. The S-Max is quite sporty by MPV standards with fairly firm suspension, so it tends to shimmy from side to side a bit at lower speeds and the suspension picks up on small imperfections in the road. That said, it isn’t as harsh over potholes as some MPVs, such as the Citroën C4 Spacetourer, and it never borders on being uncomfortable. What’s more, the ride is very settled on motorways and A-roads, making the S-Max a good choice if you regularly cover long distances. The sportier ST-Line S-Max gets firmer suspension but the differences compared with the standard set-up are marginal. This is worth considering if your commute includes lots of winding roads. If you regularly tow a caravan or trailer, self-levelling suspension is a relatively affordable option, although it isn’t available on ST-Line or four-wheel drive versions. 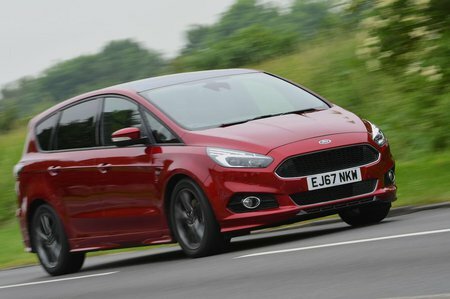 MPVs don’t get much more enjoyable to drive than the S-Max; it combines lots of grip with minimal body lean. In fact, it handles like a smaller, lighter car and is impressively agile along twisting roads. Although the steering is inclined to return to centre rather too aggressively, it’s precise enough to help you place the car exactly where you want it through bends. It’s also easy to spin at low speeds, making parking in relatively tight spaces surprisingly easy. Body movements are also exceptionally well controlled, so the S-Max doesn’t suffer from the unsettling, wallowy road manners that afflict many other MPVs. The S-Max is no spring chicken and perhaps the one area where it’s starting to show its age is braking. As well as feeling quite wooden and difficult to modulate at low speeds, the pedal needs a substantial amount of pressure to get enough stopping power from higher speeds, especially when the car is fully laden. All of the engines we’ve tried are relatively smooth and hushed. The 148bhp 2.0-litre diesel – which will be the choice for the majority of buyers – is certainly more refined than the equivalent engines in rivals including the C4 Spacetourer. It only becomes vocal at high revs and you don’t feel too many vibrations through the major controls. 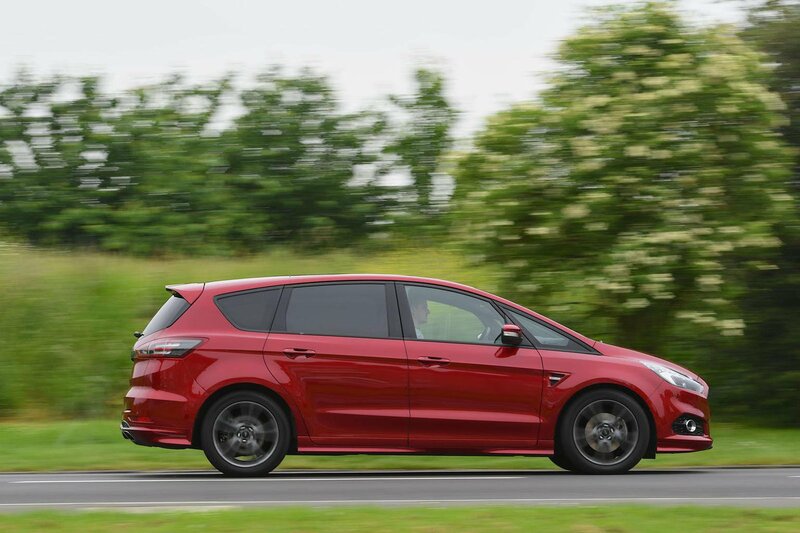 There’s road noise on the motorway – especially on versions with big alloy wheels – but no more than in most key competitors, and the S-Max does a good job of quelling wind noise. The petrol engines are particularly quiet, especially around town. The six-speed manual gearbox has a slick action that makes it pleasant to use, while the Powershift automatic 'box (standard with some engines and optional on others) shifts smoothly other than the occasional jolt at low speeds.